Hi! 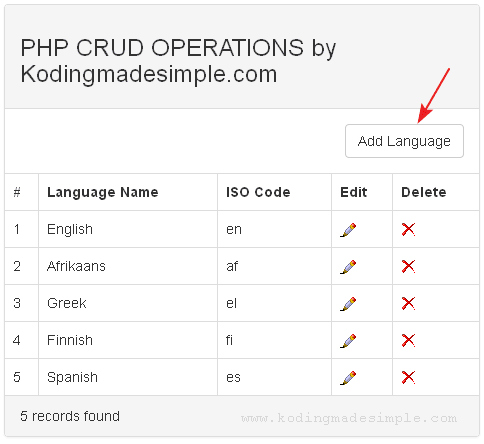 This tutorial will show you How to Create Simple CRUD Operations in PHP and MySQL. 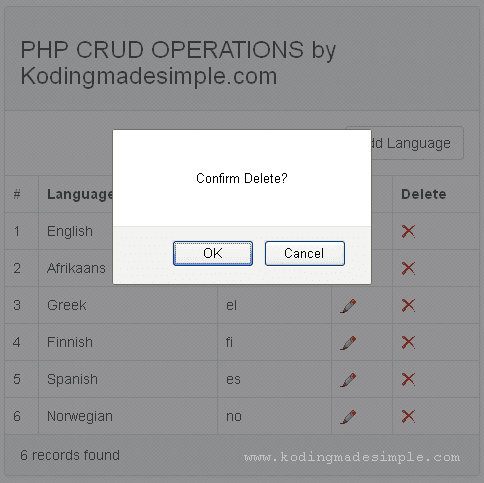 CRUD stands for CREATE, READ, UPDATE and DELETE operations performed on Database Management System. To be more precise, To insert records into database, Retrieve records from database, Edit or Update records in database and Delete records from database are the four primitive sql queries performed, together named as CRUD. Building PHP and MySQL CRUD application is one of the basic skills required for a PHP Programmer and below we'll see about creating simple crud operations using PHP & MySQL. We'll need database for building CRUD Application. So first we'll create one. 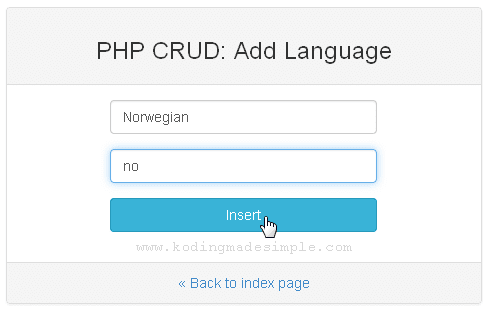 This is the mysql database we are going to use for the PHP MySQL CRUD demo. Note: I have included some sample rows to the table. If you don't want, just create the table and skip the insert step. Here's the database connectivity file that establishes connection from php to mysql using MySQLi library. Please make the changes according to your need. For our CRUD application we'll need to open mysql connection across several files. So it's better to create a separate file and include it on the places we need. 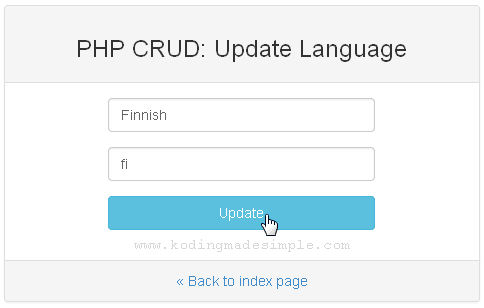 The first process of CRUD is Create which means inserting new records into database. So we need to create user interface to add new language records for our 'tbl_language' table. Although we have three fields in 'tbl_language', the field 'id' is auto generated primary key. So we have included only two textboxes for name and code fields for the user to provide input. The next one is the Read operation. Here we have to fetch records from the language table and display it in table format along with options to 'Update' and 'Delete' each row. And then is the Update process. This is where we modify the existing records in the database. In order to perform update, user has to click on the 'Edit' icon provided on a specific table row and will be taken to update form where the existing data will be automatically populated in the input fields. Then user has to modify the field values and click on 'Update' button to edit that specific record in database. Delete is the final CRUD operation. This is about deleting existing table records. In order to delete a particular row or record, user has to click on the 'Delete' icon visible on the table row and that record will be deleted from the database after getting confirmation from the user to avoid accidental clicks. We don't have separate file for delete process. It is handled in index.php file itself. Now click on the 'Add Language' button at the top to insert new records. This will take you to the insert form. Provide the necessary data and click 'Insert' button to add record. And the language table on the index page will be updated with the new record you just added. Do the required changes and click on 'Update' button to complete updating the record. Note: This demo uses Twitter Bootstrap CSS for creating user interface which is optional. That was all about building simple crud in php and mysql. 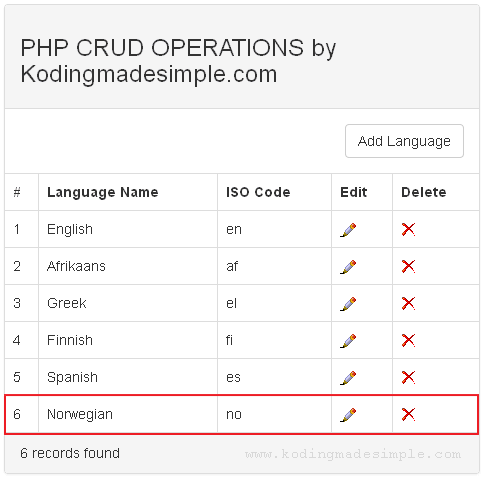 I hope you like this PHP MySQL CRUD Operations tutorial. Meet you in another interesting post!